Registration is encouraged but drop-ins are just as welcome. This event is open to all OCAD U students. We encourage students to bring their own reusable bottles/cups as well as reusable containers to bring goodies home. Advise our nurse Sarah of any dietary restrictions at scree@ocadu.ca, and feel free to contact her with any questions or to sign up in advance. A special thanks to Nora Bahgat for designing our poster, and for sharing her baking talents with the OCAD U community! Feeling Awful? Have a Waffle! Feeling Stressed? Working at school into the late hours of night? Come and get a free, freshly made waffle topped with delicious toppings and made with love. (Formerly OCAD Christian Fellowship) We want to share love and support the larger OCAD U community as well as the city by fostering a caring community through our actions and events. We hope to welcome and create safe spaces for people to engage and grow in their faith. We also want to encourage others to learn and grow to use their skills and talents to serve the larger community. Read more about Feeling Awful? Have a Waffle! OCAD U Student Group OCAD U MUSLIM STUDENT ASSOCIATION is having a bake sale. Proceeds support group programming. Kathryn Ellis Wins HotBlack Coffee Prize! Many thanks to all who submitted their Best Eats recommendations! Kathryn Ellis, Community & Events Coordinator, Imagination Catalyst, has won a HotBlack gift card. Read more about Kathryn Ellis Wins HotBlack Coffee Prize! 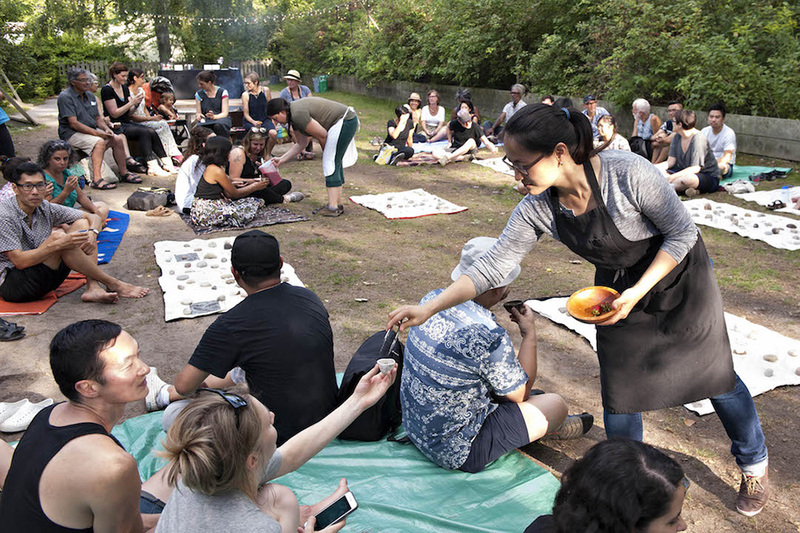 In the summer of 2016, Gendai Gallery — a Toronto institution with a focus on the intersection of East Asian perspectives and diverse cultures— launched the experimental culinary project MMMMM… Gendai Kitchen. This initiative presents programming that aligns itself with the seasons and focuses on a different natural food source in each iteration, or case in point: spring featuring sugar, summer featuring rock, fall featuring seed, and winter featuring salt. Two artists have been assigned to produce content for each season, and with OCAD U alumni including Myung-Sun Kim, Lisa Myers and Stuart Sakai on board, the results have been delectable. Summer: Lisa Myers with Myung-Sun Kim, miijim for time beings, 2016. Photo by Morris Lum. 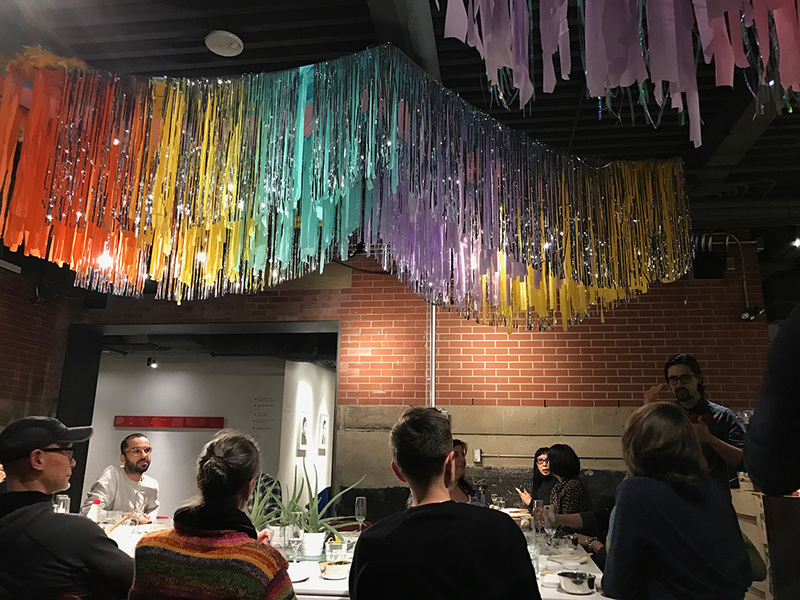 The program’s curators, Emily Fitzpatrick and Maiko Tanaka, have brought something refreshingly original to Toronto’s art scene. The concept includes more familiar offerings, such as artist-hosted meals, but also a subscription service. Subscribers receive an artist’s multiple for every season of the year, delivered right to their front doors! The multiples are created as collaborative pairings with the artist-hosted presentations in order to highlight and explore the multiple, which enhances the presentation, and vice-versa. For example, in the winter iteration of the project, Mitchell Akiyama’s multiple Elements of Exchange — a collection of synthetically crafted salts mimicking those found in bodily fluids, such as sweat and tears — was used in the food prepared by Stuart Sakai in his workshop Salt of the Body. Fall: Diane Borsato, ALL OUR FLOURISHING IS MUTUAL, 2016. Photo by Morris Lum. The subscription, limited to just 50, is enticingly exclusive, and yet accessible. The price tag for this four-piece artwork delivery service is a mere $250. Furthermore, if the cost of a year-long membership is still out of reach, the programming around the multiples is free to all. Not only are the events free, but they also take place in various locations such as Artscape Gibraltar Point and the Theatre Centre, which engage and bring together different communities from across the city. Winter: Mitchell Akiyama, Elements of Exchange, 2017. Photo by Jacob Pojar. Beyond its creative and accessible format, MMMMM… Gendai Kitchen is also vanguard because of the ideas it tackles. The five Ms of MMMMM… Gendai Kitchen function as both a clever onomatopoeia and acronym. 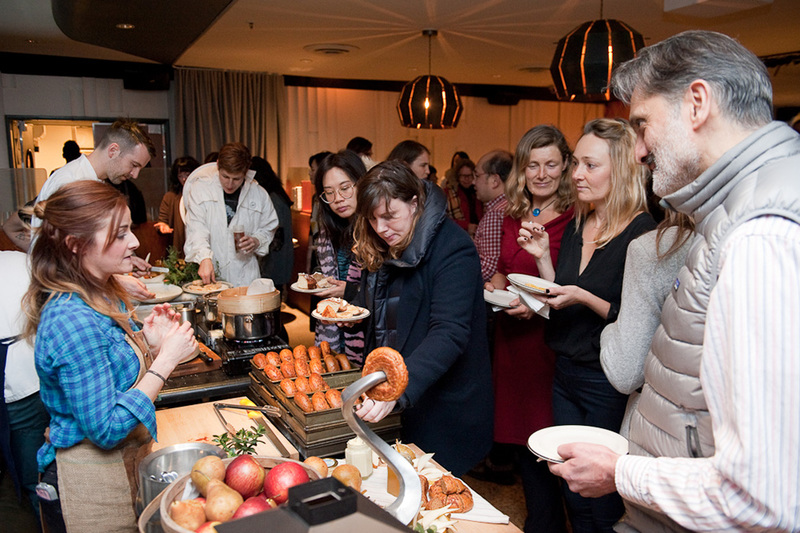 According to the prospectus, the Ms stand for Mapping, Myth, Mobility, Magic and Migration, and together act as “maxims for a deeper, complicated and historical engagement with contemporary food politics, economy and place.” For example, Diane Borsato’s event ALL OUR FLOURISHING IS MUTUAL (BREAD AND HONEY) at The Drake Hotel served up a sampling of five honeys produced throughout the GTA, which revealed distinct flavour variations among products from different neighbourhoods and beekeepers. The presentation encouraged visitors to reflect on the movements of flora and fauna throughout the city, the potential to integrate oneself into the ecosystem in a healthy way, and what one can learn from eating locally. Although three seasons have already passed, it’s not too late to experience spring with Gendai Kitchen. The upcoming season will celebrate the motif of sugar with an event by Lesley Loksi Chan, and a multiple by Karen Tam. For more information please visit www.gendaikitchen.squarespace.com. Build Your Own Grilled Cheese!!! Printmaking Thesis and Publication Capstone’s fundraising initiative! BUILD YOUR OWN GRILLED CHEESE!!! The students are raising money towards renting a venue for an end of year group exhibition, as well as exploring the possibilities of a group trip. Read more about Build Your Own Grilled Cheese!!! HWC Peer Wellness Educator Cooking Club! Read more about HWC Peer Wellness Educator Cooking Club! Come learn an easy, economical recipe for free, while hanging with nice folks and having a snack! Organized by the HWC Peer Wellness Educators. Read more about Cheap Eats Cooking Club!